If you and your customers are tired of the same old merchandise then we have the cure. Our unique line of licensed sports ticket displays, ticket-related products & unique sports art is sure to reignite interest and bring in new sales. The items we manufacture are licensed by MLB, MLBPA, Baseball Hall of Frame, NHL, NBA & the Collegiate Licensing Company. 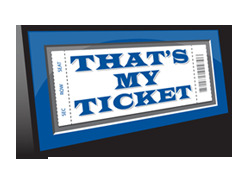 We will work with you closely on hot-market items as well as keep you updated on our constantly expanding line of ticket-related products. During the past several years, That’s My Ticket has developed a very successful drop-ship program. We work with many of the Internet’s leading retailers and are always looking to add new partners. Our turn-key drop-ship program has high-resolution images and sales text ready to go. Call us today to discuss details, and if our businesses match, you could be selling our products as fast as you can get them on your site. Our items are available at most every MLB ballpark, NHL and NBA arena. Additionally you can find our items in leading retailers and numerous regional stores throughout the country.